An annual table, book, or the like, comprising a calendar of days, weeks, and months. Among the Jews it was the holy prerogative of the patriarch or president of the Great Sanhedrin to fix the calendar and according to it proclaim the new moon. Witnesses who reported their having perceived the new moon were heard, their statements carefully examined, and perhaps compared with the result of some esoteric calculation. Hence the phrase "sod ha 'ibbur" (the mystery of the calculation), though it may perhaps apply altogether to the intercalation. These observations and researches gradually crystallized into a science, the oral traditions having been reduced to a literature on the Calendar (see Chronology). Luaḥ, the Hebrew equivalent for Almanac, means literally a table or tablet. Most of the works on chronology naturally contained such a calendar. It included the proper designation of every day as part of the week as well as part of the month; the designation of the parashah (the weekly Sabbath portion of the Pentateuch); the dates of feasts and general and local fasts; furthermore, the exact date of the molad (new moon) and the teḲufot (the quarter-days of the year), as well as the beginning and end of the shealah (the time when a short prayer for rain is added to the eighteen benedictions). Quite another appearance is borne by calendarswhich are calculated for more than one year, for a hundred years, or when they are meant to be perpetual. These must be classified as chronological literature. The Hebrew calendar contained originally no literary supplements, its only aim being to give a list in order of time of the days of the year. This changed, however, with the composition of the Jewish calendar in a European language. The nineteenth century introduced the literary annual which has become an almost indispensable part of the Almanac. The Almanac first appeared as a tablet, then as a booklet, sometimes appended to the prayer-book or Pentateuch. In the synagogue the tablet was used exclusively. Written Hebrew calendars were easily lost; and, therefore, few have come down to us. But among the discoveries made in the Genizah of Cairo there are also some calendars, the margins of which are illuminated with arabesques. Only through the spread of the art of printing did this kind of literature grow up. The first printed Almanac known came from the printing-office of di Gara at Venice, 1597. It is printed on a folio sheet. In towns where Hebrew printing-offices existed there appeared every year an Almanac on a single sheet or in a booklet. Thus almanacs have been annually published in the city of Prague since 1655, at Venice since 1670, and at Frankfort since about 1670. Owing to the great fire in the last-named city, 1711, the Almanac was published at Homburg; and from it was evolved the well-known Rödelheim Almanac, which is still being published there. Gradually these calendars were enlarged by the insertion of the memorable days in Jewish history, the civil dates, the Christian festivals, and the days of various fairs. Similar in composition and size are the bibliographically well-known calendars printed at Amsterdam since 1707, at Dyhernfurth since 1712, at Wilmersdorf since 1715, at Mantua since 1727, at Altona since 1738, at Berlin since 1739, and at Fürth since 1745. The Sulzbach Almanac contains not only all memorable days, among which it counts the fires at Prague (1689), Frankfort-on-the-Main (1715), Posen (1718), Nikolsburg (1721), but also the birthdays of the rulers and princes of Europe. Since 1758 a list of the most important highways has been added. The calendar printed at Cassel in 1790 gives a list of the Hesse-Cassel princely family and "information when all the mails at Cassel leave and arrive." The calendar of Metz gives also a list of the festivals and names of the months which were instituted by the French Revolution. The first Almanac which contained a literary supplement was published by J. Heinemann in Berlin, 1818-20, under the title "Almanach für die Israelitische Jugend," as the Oxford publication, "The Jewish Kalendar in the Year 5452" (1692), does not belong to this category. The following bibliography, which includes only calendars published in the nineteenth century, lays no claim to completeness. Only those almanacs are noted which cover a period of not less than one year. The Jewish Calendar for Fifty Years (1854-1904), with an Essay on the Jewish Calendars, by J. J. Lyons and Abraham de Sola. Montreal, 1854. The American-Hebrew Manual, a Calendar for Eighteen Years, with a Collection of Events, etc., by A. N. Coleman. Troy, N. Y., 1883. The Centurial: Calendar for One Hundred Years, by E. M. Myers. New York, 1890. Harkavy's Volks-Kalender. New York, 1895-1900. Jewish Year-Book, by Cyrus Adler, 1899 and the years following. Year-Book of Various Congregations, Keneset Yisrael and Rodef Shalom, in Philadelphia. Hebrew Almanach. Bloch Publishing and Printing Co., Cincinnati, Ohio, in progress. American Jews' Annual ( ). Bloch Publishing and Printing Co., Cincinnati, Ohio. Ed. by George Wise, 1885 and the years following. Kalender u. Jahrbuch für Israeliten auf das Jahr 5603-08 . . . herausgegeben von Isidor Busch. 6. Jahrg. Vienna, 1842-47. Elsö Magyar Zsidó Neptár és Evkönvyo 1848. J. K. Szökö, Pest, 1848. Strenna Israelitica Contenente il Calendario Ebraico . . . ed. un annuario . . . elaborata da Isacco Reggio. Görz, 1852. Illustrirter Israelitischer Volkskalender . . . nebst Gallerie von Jüdischen Merkwürdigkeiten . . . herausg. v. W. Pascheles. Prague, 1852-94. Jahrbuch für Israeliten, 5615-24 (1854-64) . . . herausg. v. Jos. Wertheimer. Neue Folge, 10. Jahrg. Zweite Folge, 5626-28 (1865-67) . . . herausg. v. S. Szantó. Jahrg. 1-3. Vienna, 1854-68. Illustrirtes Israelitisches Jahrbuch für Ernst und Scherz auf die Jahre 5620 und 5621 (1859-61) . . . Herausgabe und Verlag v. S. Winter . . . 2. Jahrg. Pest, 1859-60. Jahrbuch f. d. Israelit. Kultusgemeinden in Ungarn. herausg. v. Leop. Rosenberg. 1. Jahrg. Arad, 1860. Zeitbote, Der Israelitische Kalender f. d. J. 5625. Zur Unterhaltung und Belehrung. 1. Jahrg. Prague, 1864. Bikkurim. Jahrbuch für Freunde der Hebr. Sprache u. Literatur . . . herausg. v. N. Keller. 2. Jahrg. Vienna, 1864-65. Brandeis' Illustrirter Israel. Volkskalender . . . herausg. u. redigirt v. Jacob B. Brandeis. Prague, 1880 and they ears following. Taschenkalender für Israeliten. Brünn, 1882 and the years following. Zsidó Közigurgestési Neptár, ar 5650 Ki Érn; Budapest, 1889, 1890. Luaḥ (Hebrew and German). Vienna, 5657 (1896-97). Jodish Almanak, for Skudaaret 5622. Forfallet ag udgivet af M. Mielziner. Copenhagen, 1861. Abendana, J.—The Jewish Kalendar, containing Account of their Fasts and Festivals for the Year 5452. 32mo. Oxford, 1692. Also published for 1693, '94, '95, '96, and '99. 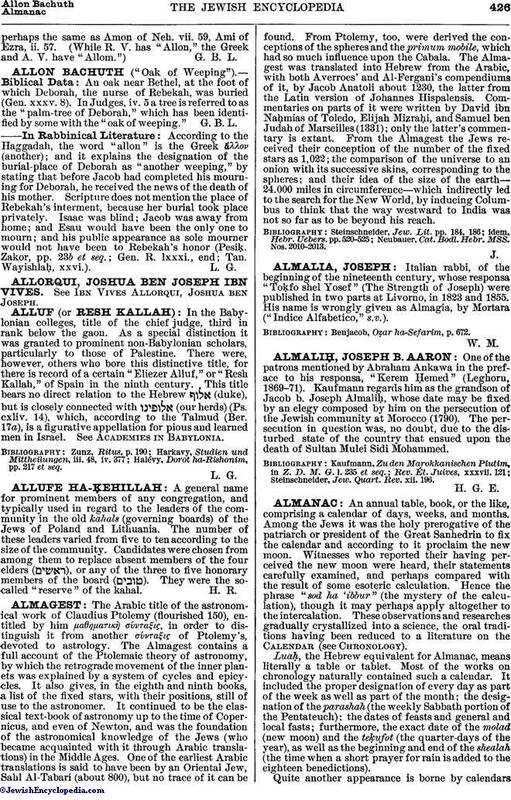 A. Alexander.—Almanack for Jewish Commercial Travelers, with Names of English Towns in Hebrew Letters, Giving Details of Coaches, Market Days, etc. 1782. A New Calendar for the Years 5551-5600. 12mo. 1791. Printed by permission of the gentlemen of the Mahamad. Moses Meldola.—A New Almanack for the Year 5568 A.M. 12mo. 1807.
, Hebrew and English Almanack for the Year 5596, corresponding with 1835-36. 1835. 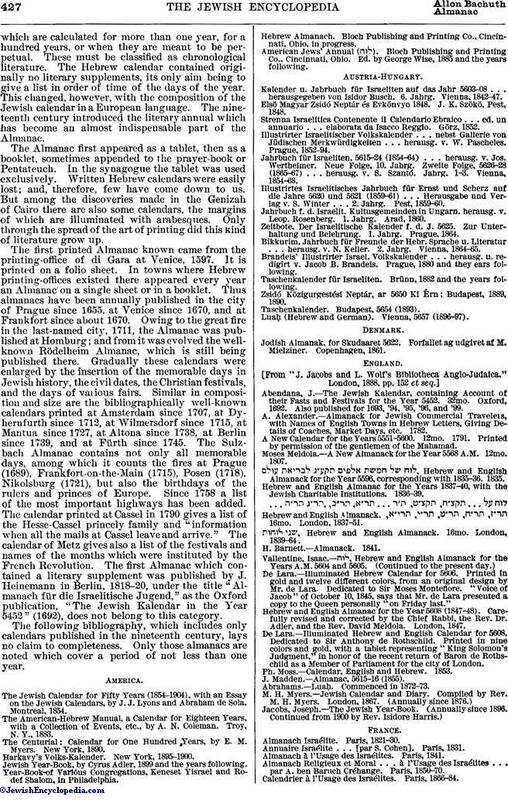 Hebrew and English Almanac for the Years 1837-40, with the Jewish Charitable Institutions. 1836-39. Hebrew and English Almanack. 16mo. London, 1837-51.
, Hebrew and English Almanack. 16mo. London, 1839-64. De Lara.—Illuminated Hebrew Calendar for 5606. Printed in gold and twelve different colors, from an original design by Mr. de Lara. Dedicated to Sir Moses Monteflore. "Voice of Jacob" of October 10, 1845, says that Mr. de Lara presented a copy to the Queen personally "on Friday last." 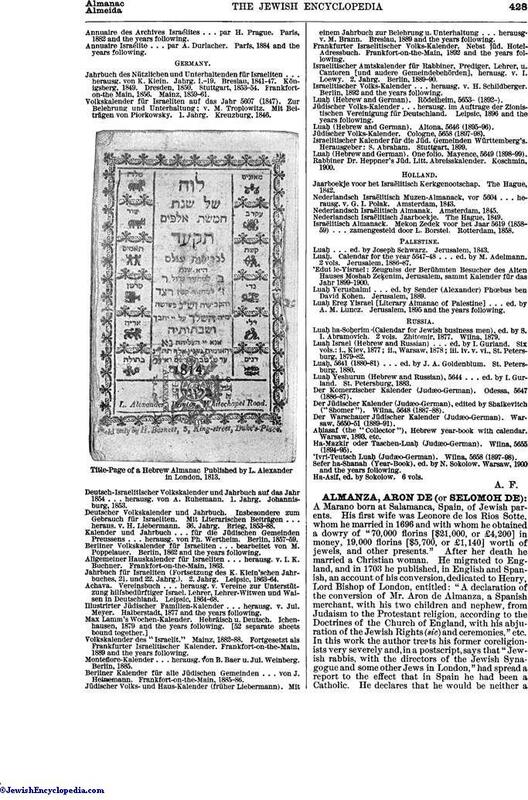 Hebrew and English Almanac for the Year 5608 (1847-48). Carefully revised and corrected by the Chief Rabbi, the Rev. Dr. Adler, and the Rev. David Meldola. London, 1847. De Lara.—Illuminated Hebrew and English Calendar for 5608. Dedicated to Sir Anthony de Rothschild. Printed in nine colors and gold, with a tablet representing "King Solomon's Judgment," in honor of the recent return of Baron de Roths-child as a Member of Parliament for the city of London. Ph. Moss.—Calendar, English and Hebrew. 1853. Annuaire Israélite . . . [par S. Cohen]. Paris, 1831. Almanach à l'Usage des Israélites. Paris, 1841. Almanach Religieux et Moral . . . à l'Usage des Israélites . . . par A. ben Baruch Créhange. Paris, 1850-70. Calendrier à l'Usage des Israélites. Paris, 1866-84. Annuaire des Archives Israélites . . . par H. Prague. Paris, 1882 and the years following. Annuaire Israéilte . . . par A. Durlacher. Paris, 1884 and the years following. Jahrbuch des Nützlichen und Unterhaltenden für Israeliten . . . herausg. von K. Klein. Jahrg. 1.-19. Breslau, 1841-47. Königsberg, 1849. Dresden, 1850. Stuttgart, 1853-54. Frankfort-on-the Main, 1856. Mainz, 1859-61. Volkskalender für Israeliten auf das Jahr 5607 (1847). Zur Belehrung und Unterhaltung; v. M. Troplowitz. Mit Beiträgen von Piorkowsky. 1. Jahrg. Kreuzburg, 1846. 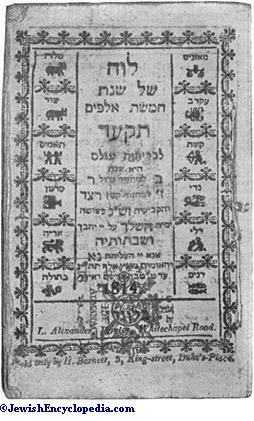 Title-Page of a Hebrew Almanac Published by L. Alexander in London, 1813. Deutsch-Israelitischer Volkskalender und Jahrbuch auf das Jahr 1854 . . . herausg. von A. Ruhemann. 1. Jahrg. Johannisburg, 1853. Deutscher Volkskalender und Jahrbuch. Insbesondere zum Gebrauch für Israeliten. Mit Literarischen Beiträgen . . . heraus. v. H. Liebermann. 36. Jahrg. Brieg, 1853-88. Kalender und Jahrbuch . . . für die Jüdischen Gemeinden Preussens . . . herausg. von Ph. Wertheim. Berlin. 1857-59. Berliner Volkskalender für Israeliten . . . bearbeitet von M. Poppelauer. Berlin, 1862 and the years following. Allgemeiner Hauskalender für Israeliten . . . herausg. v. I. K. Buchner. Frankfort-on-the-Main, 1863. Jahrbuch für Israeliten (Fortsetzung des K. Klein'schen Jahrbuches, 21. und 22. Jahrg.). 2. Jahrg. Leipsic, 1863-64. Achava. Vereinsbuch . . . herausg. v. Vereine zur Unterstützung hilfsbedürftiger Israel. Lehrer, Lehrer-Witwen und Waisen in Deutschland. Leipsic, 1864-68. Illustrirter Jüdischer Familien-Kalender . . . herausg. v. Jul. Meyer. Halberstadt, 1877 and the years following. Volkskalender des "Israelit." Mainz, 1882-88. Fortgesetzt als Frankfurter Israelitischer Kalender. Frankfort-on-the-Main, 1889 and the years following. Montefiore-Kalender . . . herausg. von B. Baer u. Jul. Weinberg. Berlin, 1885. Berliner Kalender für alle Jüdischen Gemeinden . . . von J. Heinemann. Frankfort-on-the-Main, 1885-86. Jüdischer Volks-und Haus-Kalender (früher Liebermann). Mit einem Jahrbuch zur Belehrung u. Unterhaltung . . . herausg. v. M. Brann. Breslau, 1889 and the years following. Frankfurter Israelitischer Volks-Kalender. Nebst jüd. Hotel-Adressbuch. Frankfort-on-the-Main, 1892 and the years following. Israelitischer Amtskalender für Rabbiner, Prediger, Lehrer, u. Cantoren [und audere Gemeindebehörden], herausg. v. I. Loewy. 2. Jahrg. Berlin, 1889-90. Israelitischer Volks-Kalender . . . herausg. v. H. Schildberger. Berlin, 1892 and the years following. Luaḥ (Hebrew and German). Rödelheim, 5653-(1892-). Jüdischer Volks-Kalender . . . herausg. im Auftrage der Zionistischen Vereinigung für Deutschland. Leipsic, 1896 and the years following. Luaḥ (Hebrew and German). Altona, 5646 (1895-96). Jüdischer Volks-Kalender. Cologne, 5658 (1897-98). Israelitischer Kalender für die Jüd. Gemeinden Württemberg's. Herausgeber: S. Abraham. Stuttgart, 1899. Luaḥ (Hebrew and German). One folio. Mayence, 5649 (1898-99). Rabbiner Dr. Heppner's Jüd. Litt. Abreisskalender. Koschmin, 1900. Jaarboekje voor het Israëlitisch Kerkgenootschap. The Hague, 1842. Nederlandsch Israëlitisch Muzen-Almanack, vor 5604 . . . herausg. v. G. I. Polak. Amsterdam, 1843. Nederlandsch Israëlitisch Almanak. Amsterdam, 1845. Nederlandsch Israëlitisch Jaarboekje. The Hague, 1849. Israëlitisch Almanack. Mekon Zedek voor het Jaar 5619 (1858-59) . . . zamengesteld door L. Borstel. Rotterdam, 1858. Luaḥ . . . ed. by Joseph Schwarz. Jerusalem, 1843. Luaḥ. Calendar for the year 5647-48 . . . ed. by M. Adelmann. 2 vols. Jerusalem. 1886-87. 'Edut le-Yisrael: Zeugniss der Berühmten Besucher des Alten Hauses Moshab ZeḲenim, Jerusalem, sammt Kalender für das Jahr 1899-1900. Luaḥ Yerushalmi . . . ed. by Sender (Alexander) Phœbus ben David Kohen. Jerusalem, 1889. Luaḥ Ereẓ Yisrael [Literary Almanac of Palestine] . . . ed. by A. M. Luncz. Jerusalem, 1895 and the years following. Luaḥ ha-Soḥerim (Calendar for Jewish business men), ed. by S. I. Abramovich. 2 vols. Zhitomir, 1877. Wilna, 1879. Luaḥ Israel (Hebrew and Russian) . . . ed. by I. Gurland. Six vols. : i., Kiev, 1877; ii., Warsaw, 1878; iii. iv. v. vi., St. Petersburg, 1879-82. Luaḥ, 5641 (1880-81) . . . ed. by J. A. Goldenblum. St. Petersburg, 1880. Luaḥ Yeshurun (Hebrew and Russian), 5644 . . . ed. by I. Gurland. St. Petersburg, 1883. Der Komerzischer Kalender (Judæo-German). Odessa, 5647 (1886-87). Der Jüdischer Kalender (Judæo-German), edited by Shaikevitch ("Shomer"). Wilna, 5648((1887-88). Der Warschauer Jüdischer Kalender (Judæo-German). Warsaw, 5650-51 (1889-91). Ahiasaf (the "Collector"), Hebrew year-book with calendar, Warsaw, 1893, etc. Ha-Mazkir oder Taschen-Luaḥ (Judæo-German). Wilna, 5655 (1894-95). 'Ivri-Teutsch Luaḥ (Judæo-German). Wilna, 5658 (1897-98). Sefer ha-Shanah (Year-Book), ed. by N. Sokolow. Warsaw, 1900 and the years following. Ha-Asif, ed. by Sokolow. 6 vols.